I'm about to trace the pattern pieces (since I want to be able to use the pattern again post-preggo) but deliberating over size 6 (bust measurement 36") vs. size 8 (bust measurement 37"). 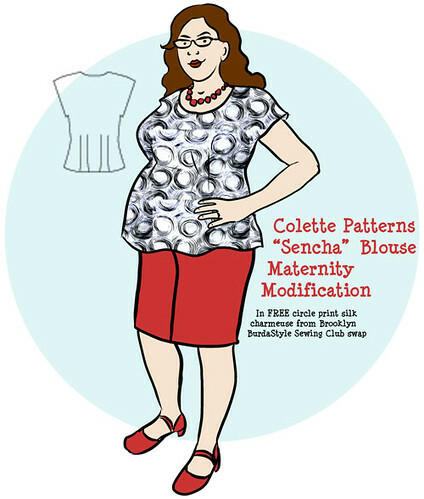 I usually choose patterns by high bust (which used to be 34" for me but now as my ribcage has grown during pregnancy is more like 36") and then do a major FBA but I've heard Colette Patterns are more generous in that area than the B-cup Big Four standard. I'll still need a serious FBA either way, as my full bust is 41." well... don't tell anyone, but that's actually what the tutorial I've been teasing at is about! I don't draw myself freehand for this because it wouldn't give an accurate picture--you really have to use photographs to get a good croquis. I'll hopefully have that part of the tutorial up later this week!